It seems that most of the restaurant openings around here happen when I’m out of town. In this case, while we were in Belgium, Worthy Kitchen, the sister restaurant to Worthy Burger, opened up in Woodstock. While Worthy Burger had some startup issues like most any restaurant, after a few months they hid their stride and have been wildly successful (sometimes to the point of being a victim of that success, with my personally experiencing 20 minute lines just to check out). So I wasn’t surprised to hear a few months ago that the Worthy Burger folks were looking at opening new locations, and then hearing that they had a specific spot picked out in Woodstock. 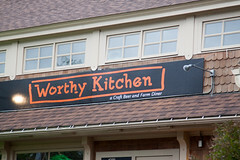 Located on the east side of town, Worthy Kitchen is in a slightly odd spot sharing a building with a physical therapist (who must be thrilled with the arrangement) in a restaurant location I had previously considered cursed since it’s had several failed restaurants in it in my 13 years of living in the area (remember the EastEnder or the Lemongrass Cafe? Apparently nobody did.). 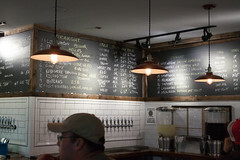 But basically, they’ve done up a similar concept: the interior is focused upon the bar, with an impressive list of taps, and then they’ve got a chalkboard menu (like Worthy Burger, some of the items are constant, and others rotate in and out). Looking over the specials that day, Carol opted for a duck confit sandwich. Myself, I’m always drawn to the idea of a good fried chicken, so I had to give that a try. A kale salad on the side, and we settled down at a table drinking our beer (mine was a nice Helles from Trapp, I don’t recall what Carol’s was). Carol’s confit was a nice start to the things. 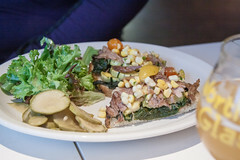 Confit duck, served as an open-face sandwich, this was a pleasant dish. I’ve had a lot of dubious confits, but this one was tender, flavorful, and not at all oily, Served up on a nice crunchy slice of toast, and it was a nice combination of flavor and texture. So, next was my fried chicken. How was it? It was, in short, worthy. I’ll admit, I was a little dubious at first, since when my fried chicken arrived, I quickly discovered it was boneless. 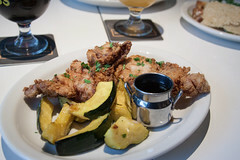 I’ve got a general rule, and that’s “boneless chicken, in general, will never be as good as bone-in chicken”, and I’ve stuck with that (I even have some nice data points on that, like how Farm House in Burlington shifted from bone-in quarters to boneless tenders for their chicken). But here I was pleasantly surprised: the chicken was good. Really good. In fact, this is probably the best boneless fried chicken I’ve ever had, with good flavorful meat, a juicy interior, a crispy exterior, and a coating flavor that complemented instead of hid the chicken. It wasn’t the most photogenic chicken on the planet, but, hey, I’ll ignore that for the sake of taste. It’s not as good as some of the better examples of bone-in chicken to be had, but it’s close. Real close. Makes me wonder how much better they could do if they tried bone-in chicken (I did ask the management about this, and they are of the opinion that customers would complain about bones…). As far as the rest of it? It comes with a soy-ginger glaze, which didn’t do much for the chicken (well, the chicken didn’t really need it), but the glaze worked well with the other side: roasted acorn squash. The squash was a little tough, but otherwise good. I’m a believer that there are squashes like delicata that can be served skin-on, but acorn isn’t one of them (on other visits, however, the side with the chicken has been roasted carrots, which we quite good). Moving on to the salad? 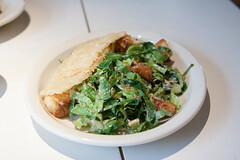 A basic caesar salad, this was conceptually an okay salad, but it had two minor flaws: first of all, the cheese garnish was huge and thick, so it was like trying to gum your way through a 1/4″ wedge of semi-toasted cheese. I see what they were trying to do, but this fell flat. And the greens themselves were chopped kale (hey, I can’t complain that much, they did sell it as a chopped salad), and to me that’s a bit of a structural issue: this kale was pretty tough, and after chopping it up raw, the result was some greens that were pretty, well, edgy. This was still a good salad, but there’s a lot of room for improvement here. Similarly, the fries here surprised me a bit. The fries at Worthy Burger, on a good day, are sublime, cooked up as nice crispy but soft packets of potato in a nice beef tallow. They are cosmetically similar at Worthy Kitchen, but they cut the fries a lot smaller and crisp them up a bit too much. The result was overcrunchy and dry fries. 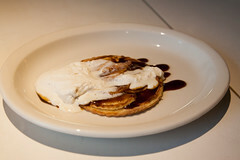 And then there was the apple tart dessert. I’m not sure what they were really going for here, but the result was two layers of dense dough around a sticky sweet filling, topped with some melting cream… This didn’t impress. Pastry should be flakey and light, this was leaden. And the overwhelming flavor was… sugar. I think I’ll be passing on dessert here for a while, although I will perhaps have to try the lard doughnuts at some point. … they don’t have you pick up your food, a server walks it back to your table for you. The server can also get additional rounds of food and beer for you, adding it into your tab. When you are done, you pay. It’s a really odd combination of counter and table service, and it seems to confuse people (most everyone gets greeted with a “Have you been here before? Can I show you how things work here?” greeting, which seems particularly inefficient). Oh well, it’s odd, but I can mostly groove with it, since at Worthy Kitchen they seem to have fixed problem of long checkout lines, and I can usually get served pretty quickly. Overall, a few hiccups, but they’ve got a lot of things going well here at the new Worthy Kitchen. 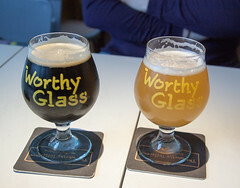 The beer side of things is running about as good as is possible, with one of the best tap lists in the state (behind Worthy Burger itself, and The Farm House in Burlington). And the food is showing a lot of promise, particularly the chicken; keep putting out items as good as that and they’ll have an even bigger hit than Worthy Burger going. But there’s still some room for improvement here. While our previous dinner at Tavernonna was quite filling, the next morning we did want to still grab a breakfast to tide us over on the drive halfway across the state to Columbia. Looking at the various area options, we decided to check out Chez Elle, located in a surprisingly quite part of the Westside neighborhood that’s somewhat hemmed in by I-670, I-35, and a bluff, for a light breakfast of coffee and crepes.